Nice Bronco! 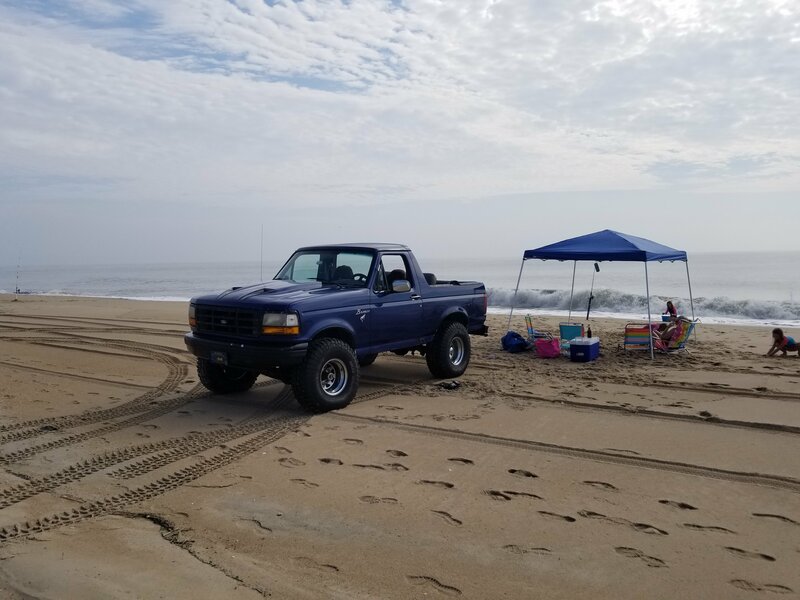 We did a lot of beach surf fuishing with our 96 too, fun times! Accessories that fail to operate with the key in RUN﻿, or that remain on when the key is turned off, may be the result of a misadjusted ignition switch rather than a malfunctioning﻿﻿ ignition switch. When your ignition key is turned to Start then let go does it have the usual "springiness" to run? The ignition switch, mounted inside column's shroud is where the spring-back is provided, but actuator(s) is often damaged.. Ensure switch is securely mounted first. "... Install the ignition switch into the column actuator hole. It may be necessary to move the ignition switch back and forth slightly to align the ignition switch mounting holes with the lock cylinder housing threaded holes. Install retaining screws. Tighten to 6-8 Nm (53-71 lb-in)..."
Remove Negative the cable from Battery & place an ammeter in-line set to the 10A range. Isolate circuit ﻿causing current drain by pulling out one fuse after another while reading the display. Current reading will drop when the fuse on the bad circuit is pulled. ﻿﻿Reinstall fuse and test components (including connectors) of that circuit to find defective component(s). Test Conclusion; The current reading (current drain) should be less than 0.05 amps. If it exceeds 0.05 amps it indicates a constant current drain which could cause a discharged battery. Possible sources of current drain are vehicle lamps (underhood, glove compartment, luggage compartment, etc.) that do not shut off properly or brake lights. If the drain is not caused by a vehicle lamp, remove the fuses from the interior fuse junction panel, one at a time, until the cause of the drain is located. If drain is still undetermined, remove fuses one at a time at the main fuse junction panel to find the problem circuit. Repeat Steps 1 through 6 of the voltmeter drain testing. Without starting engine, turn ignition on for a moment and then off. If applicable, wait one minute for the illuminated entry lamps to turn off. Connect the voltmeter and read the voltage. ^ That was my first suggestion.